EMC SMARTS – Part 3 : The Codebook explained + DEMO! We’ve come to the point where we can discuss, in more detail, the term “codebook”. Pictured in the slide is a simplified two dimensional representation of the codebook. The possible symptoms are automatically computed from the systems (switches, routers, hub, etc. ), cards, ports, and logical ports utilizing the relationships and the possible events which we have previously discovered and identified as part of the current topology maintained in RAM. What is a codebook? It is a collection of possible problem signatures. 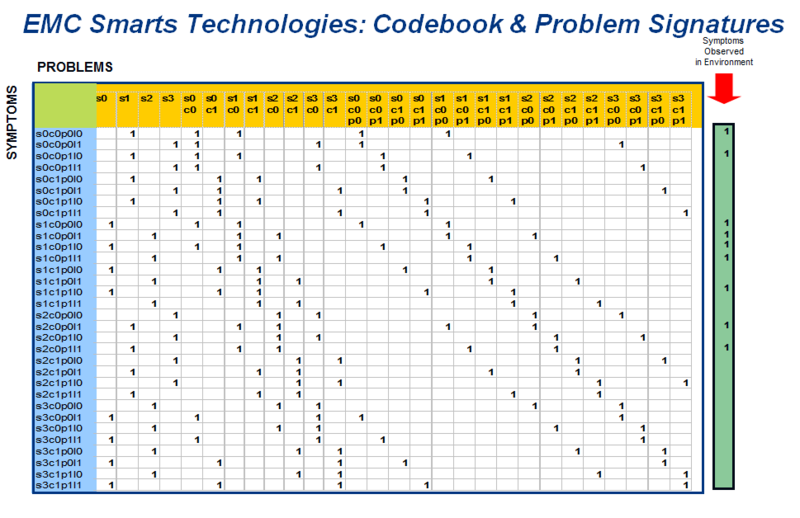 The codebook represents, for each problem, which symptoms (alarms – denoted with a 1) will occur when the problem exists. (In reality, codebooks are a multi-dimensional matrices which can contain numerous probabilities). Why do we compute signatures? The codebook uses signatures to identify problems by closely matching real-time known events to these modeled behavioral problem signatures. When events stream in, the correlation engine finds the closest match, i.e., the problem whose signature is the closest match to the events that were received. Because it looks for the closest match, not an identical match, the codebook can correlate with a high degree of accuracy, even if it does not receive all the symptoms that comprise a problem’s signature. Smarts patented codebook technology provides the fastest and most accurate problem resolution available today. Why? Because it compares monitored events to predetermined signatures. Relationships have already been factored into the codebook, and whenever relationships change, the codebook is automatically updated. This is highly efficient, because the frequency of event arrival is much higher than the frequency of topology changes. 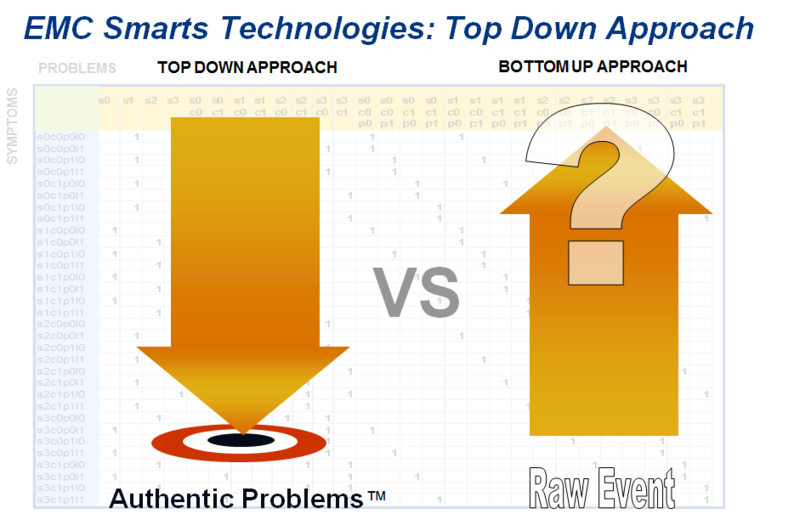 EMC Smarts applies a “top-down” methodology that considers only the critical problems whose occurrence threatens service delivery. Instead of taking every event and alarm into account when it seeks problems, it focuses only on problems that matter. Problems like faults, performance, configuration, resilience and others can be isolated and addressed proactively, sometimes before they even occur. This is a more effective method than the more common “bottom up” approach, which addresses each event individually in its attempt to manage a particular domain. Unique problem signatures in a managed environment are maintained in the Codebook. As described earlier, each problem signature identifies the set of symptoms that can be observed when the problem is active. 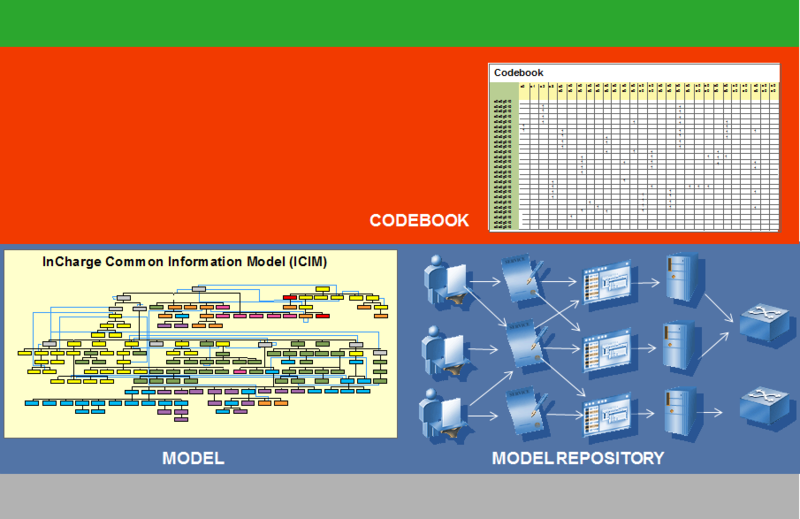 The Codebook itself is created by the Correlation Engine, which combines information in the Model Repository with the information stored in the Model Library. Periodically, the Correlation Engine compares the symptoms that have been observed in the environment with the codebook, looking for the closest match. This closest match is the root cause problem. Since the codebook engine does not require an exact match, the root cause is identified, even when symptoms are lost or when there are spurious symptoms. You’ve just observed the key components of all EMC Smarts solutions. The Correlation Engine combines information in the model repository with the information stored in the model library to create the codebook. 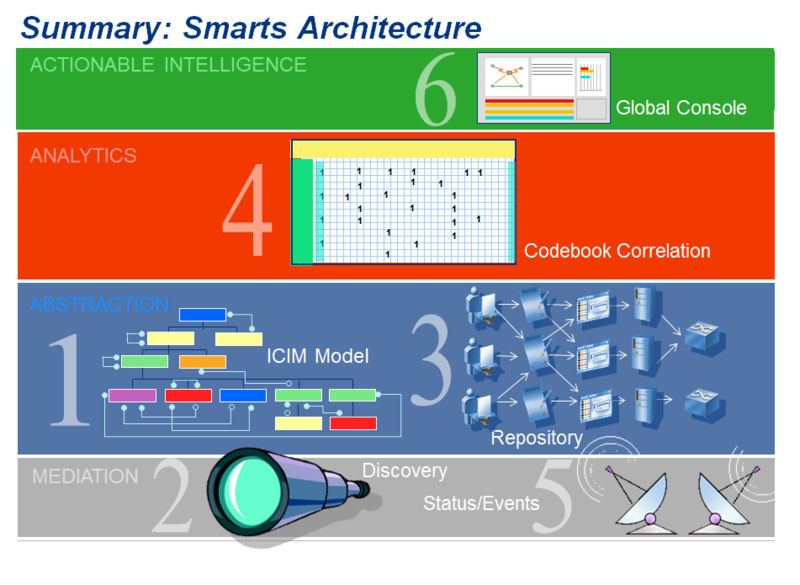 These components are fundamental to the Smarts architecture. The complete architecture supports all aspects of systems management. Each functional layer of the architecture is separated from the others, allowing for open and flexible integration and scalability. These layers are described by their functions of mediation, abstraction, analytics, and actionable intelligence. The Mediation layer quickly and accurately identifies logical and physical components of the infrastructure and application layers, as well as their relationships and interactions. Each Smarts Manager is constructed in a multi-layered fashion, as shown above. Each of the four layers has a specific function and is discussed in the following slides. The Mediation layer quickly and accurately identifies logical and physical components of the infrastructure and application layers, as well as their relationships and interactions. Information gathering is the primary function of the mediation layer. Here, input is collected as either topology related or event related information. Input can arrive from any of several sources and is updated frequently. For the domain mangers (IP, ACM, NPM, etc. ), topology information is collected via the discovery or auto discovery processes and/or via adapters from any number of sources. Event information is collected primarily via ICMP and SNMP, though many other sources can and often are used for event collection. With the abstraction layer, all physical and logical components, their relationships, behaviors, and interactions are abstracted and then uniformly represented. Within the abstraction layer, the repository is constructed based upon configuration constraints set within topology management. The Topology Manager may also be used to import repository information from import files. Also, the Policy Manager and Monitor Control are used to determine what elements of the topology are managed, frequency of polling, and the analysis of configured threshold management information. All these functions are performed upon elements of the repository which is the primary representation of all elements known to the server. The repository is one of the three core elements present in all Smarts Managers. Analytics are the brain and reasoning behind EMC Smarts. With analytics, EMC Smarts determines Root Cause and Impact Analysis of service-affecting problems, wherever they occur. The Analytics layer contains the other two core elements that make up all Smarts Managers, the ICIM Model and the Correlation Engine. 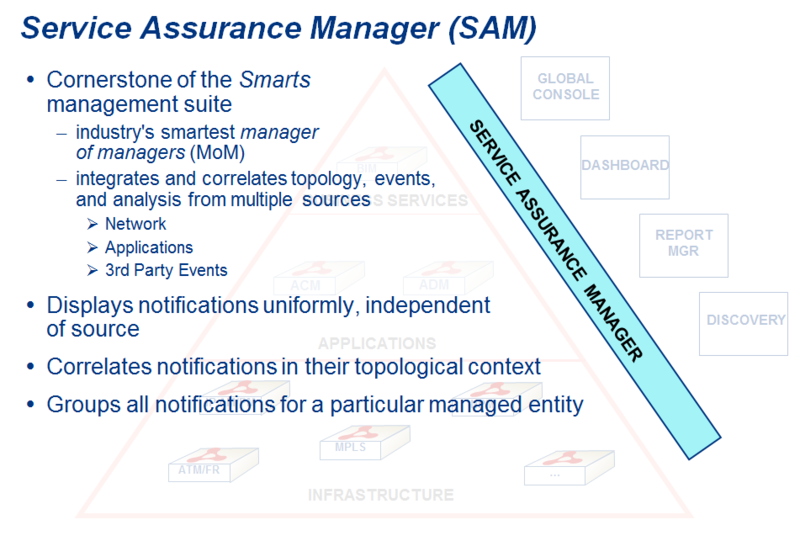 All elements that Smarts is capable on monitoring and analyzing are modeled in an object oriented representation as generic classes of objects. These generic definitions include those attributes that are common to all object instances of a given class, the kinds of relationships that can exist with other instances of the same or different classes of objects. Also, as a result of these relationships, there are events that can be identified as possible problems. Though the ICIM model is based upon the Distributed Management Task Force’s (DMTF) Common Information Model (CIM), we have taken the model as designed and enhanced it in ways that aid understanding and analyzing the kinds of problems that can occur to the modeled objects based upon the kinds of relationships that an object may have with others. The Correlation Engine performs multiple types of analysis of the symptoms reported. 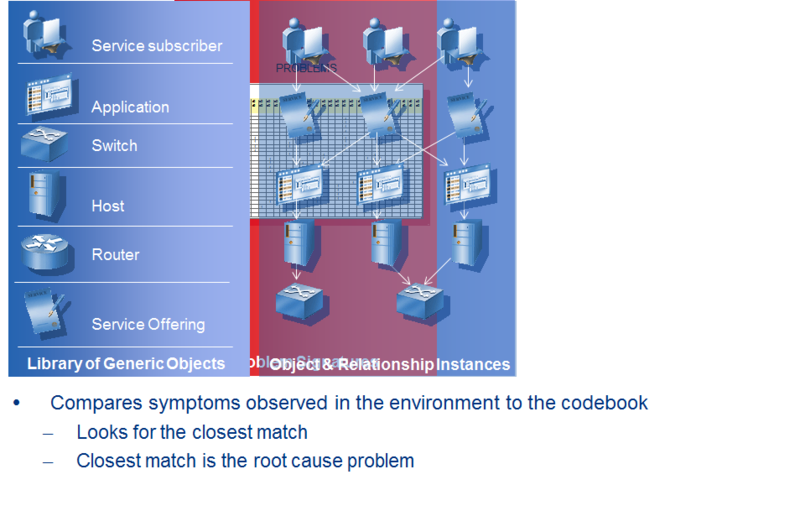 In the Domain Managers, root causes analysis if a function of the correlation processes. In Service Assurance Manager, de-duplication of error reports from multiple lower level managers is a function of the correlation engine. All analysis of problems, as they relate to repository object instances and their relationships, fall under the blanket of the Correlation Engine. The Automated Actionable Intelligence Layer delivers Smarts information in a number of ways. With Smarts Global Console and web-based Business Dashboard, the presentation of actionable information is easily customized to meet every users’ needs. Just as the mediation layer is designed to receive input in multiple ways, this layer is the output engine for Smarts services. It is the job of Actionable Intelligence to provide output in any of many formats for passing information to other Smarts Managers, adapters, report manager, logging scripts, etc. In this course, we address some of the ways the output is provided by SAM; in the IP course, we identify the various ways that domain managers provide output to Service Assurance Manager. Together, the functional layers provide an end-to-end solution for automating network service assurance. 1.First, it uses the abstraction to model the complex web of relationships in the real world. 2.Then Smarts discovers and collect events from sources in the environment to automatically populate the repository. 3.The repository represents a real time inventory that is built automatically by instantiating object classes from the library with the instances found during discovery. 4.Periodically, the Correlation Engine compares the symptoms that have been observed in the environment to the codebook to automatically isolates service-affecting problems. 5.Through pinging and polling, Smarts monitors events and data to adapt to changes in the environment. 6.The analysis provides essential actionable information by presenting the real-time state of business critical services and relating it to the health of the underlying network. 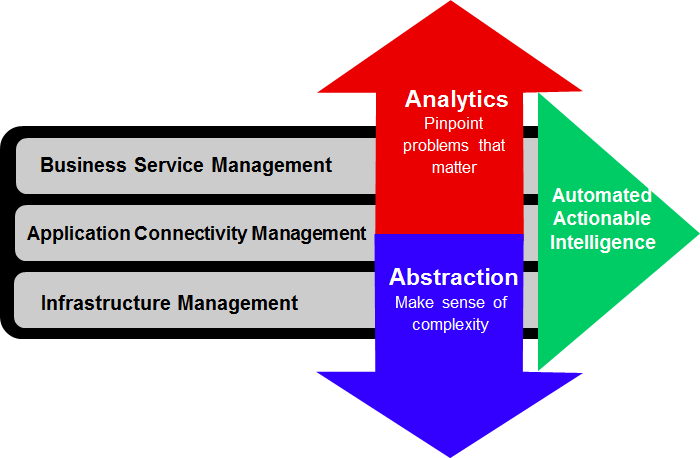 The components in this architecture work together to provide the abstraction, analysis, and automation, the guiding principle of all Smarts solutions, across all aspects of systems management, from the infrastructure layer through the applications to the business services. As individual solutions, each Smarts product provides in-depth management of a particular network, system or application domain. Combined, they work together to deliver cross-domain integration and correlation. 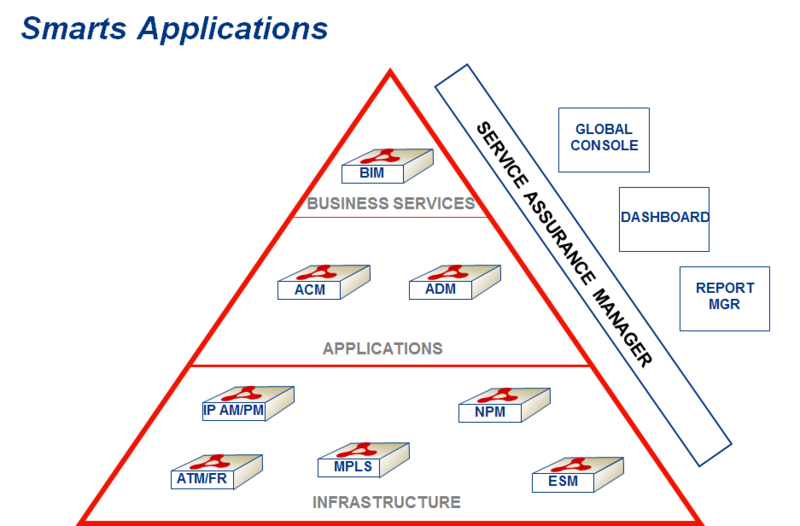 Holistic management, unique to Smarts, allows managing the different domains in the infrastructure in correlation with one another, to assure the highest availability and performance. By modeling not only the infrastructure but business objects that depend upon the infrastructure and understanding the cause and effect behaviors between them, Smarts is unique in helping align IT management with business goals. Because of the Codebook technology and the Smarts platform built around it, our solutions are far more scalable than any in the industry, while at the same time offering a lot more intelligence, automation, and adaptability. The Smarts platform enables us to rapidly extend the reach of Smarts applications to IT domains that are key to supporting your business, providing a future-proof foundation for holistic management of today’s and tomorrow’s information technology. Many applications focus on Infrastructure Management, where the root cause of service-affecting problems can be pinpointed. Application Connectivity Monitor extends Smarts’ unique integration, correlation, root-cause, and impact analysis to the applications and services domain, automatically correlating service performance with details of the health of underlying network, system, and application resources. While the Service Assurance Manager, or SAM, is by far the most intelligent manager of managers, its capabilities reach far beyond traditional MoMs and display consoles.